He then proceeds to explain one of the most-discussed episodes of last season with punter Andy Teasdall. At the ACC championship game against North Carolina, Teasdall opted to try to run the ball rather than punt it away. Swinney, clearly, was not happy, and as Teasdall came off the field, he let him know that. Swinney and members of the football team work at a local Habitat for Humanity site. Swinney certainly hasn’t used his own personal experience as a model for what family means, but he says the struggles with an alcoholic and violent father, the breakup of his parents’ marriage and foreclosure of the family home did help him be a better father and a better husband. “Sometimes you learn more from the bad than you do from the good,” he says. “You kind of have to experience it,” Teasdall says. There are two large display boards leaning in the corner of Swinney’s office, mounted versions of the Wall Street Journal “Grid of Shame.” The grid has one axis that ranges from “Weakling” to “Powerhouse” that takes into account performance on the field, and another that ranges from “Embarrassing” to “Admirable” that considers academic performance, NCAA violations, arrests and other factors including what the publication characterizes as the “ick” factor. Clemson is positioned in the top right quadrant, at the intersection of “Admirable” and “Powerhouse,” in a small group of institutions that includes Wisconsin, Stanford and UCLA. With an office full of trophies, Swinney calls this the best trophy of all and “the best accomplishment of our program.” For him, that chart is proof that it is possible both to run a football program “the right way,” and to win. For Swinney, the right way of running a football program involves being “relationship-driven,” which he describes as serving players’ hearts and not their talent. “Serve, care, love,” he says. “We’re here to serve our players, to care for them, to love them. Sometimes that means disciplining them.” Sounds sort of like a family. That became very clear to players at last season’s Orange Bowl, according to Eric Mac Lain, who finished up his Clemson football career at the 2016 National Championship game. Prior to the game against Oklahoma, three Clemson players — wide receiver Deon Cain, kicker Ammon Lakip and back-up tight end Jay McCullough — were suspended for a violation of team rules and sent home. Dabo Swinney spends a lot of time and energy trying to convince young men focused on football that life is about a whole lot more than football. And he starts that during the recruitment process. Named ACC Recruiter-of-the-Year and one of the top-25 recruiters in the nation in 2015 by Rivals.com, Co-offensive Coordinator Jeff Scott says that after having worked with Swinney for close to eight years, he can tell in the first five minutes of meeting a young man whether he’s going to be a great fit at Clemson, or whether he’s going to be looking elsewhere. That great fit, says Scott, is a young man who is goal-oriented and family-oriented and who understands the value of a college degree. In today’s world, many of those players don’t come from two-parent homes, but most of these young men, according to Scott, “would not be at the point they are, in terms of college and playing football and earning a full scholarship, if there wasn’t someone who stepped in to help in their journey —a grandmother, grandfather, coach, teacher — who’s helped along their way and changed their lives.” And these young men see a great value in having close relationships with their future coaches. If you had asked Swinney what he was planning to be when he grew up, he would probably have told you he wanted to be a pediatrician. He thought that if he were a doctor, he wouldn’t have to deal with the kind of things he dealt with growing up —having the car repossessed, losing his house, sleeping at friends’ homes. And so when he headed to Alabama, it was as a pre-med student. At some point, he realized he didn’t want to go to school for the next 10 years, so he switched to business with plans to major in hospital administration, where, as he put it, “the doctors would work for me.” He was feeling the need to get to work, make some money and move on. In the meantime, Alabama won the national championship his senior year, a great capstone to his college career on the field. Everywhere you look in the WestZone, you see reminders of what Swinney calls the core values of the program. 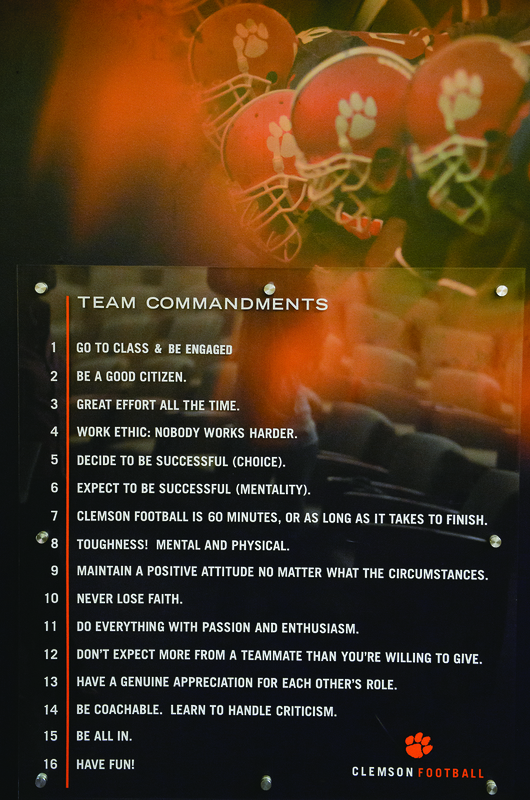 A list of “Team Commandments” (there are 16) begins with, “Go to class and be engaged,” and ends with, “Have Fun!” And the “Building Blocks of Character” may include competitive greatness, passion, discipline and confidence, but it also includes poise, sacrifice, humility, respect, courage and trust. He goes on to suggest that they need to build their own brand, so to speak, by taking advantage of career development opportunities, by building relationships, developing leadership skills — so that when they leave Clemson, they’re ready for whatever is ahead of them. You have to love that kind of comment from a coach whose job this last year had him accepting the ACC and the Orange Bowl trophies and leading a team playing their hearts out in the National Championship, moments most of us think would trump almost anything else. Everybody’s an example to somebody. At Clemson, it’s til graduation do we part. If you got hope, that gives you power in the present. At Clemson’ it’s BYOG: Bring Your Own Guts. To be an overachiever, you’ve got to be an over believer. It’s only unthinkable if you don’t think it. You’ve got greatness in you but you have to make a decision to be great. It doesn’t matter if you’re a Division I head football coach or Joe Schmo from Okemo. If you’re not anchored, you’re going to be washed away. Until we win a couple of national championships, we will always be little old Clemson. We need to stick a flag in that mountain. We’re the rednecks who moved into the nice neighborhood, but we belong. Add your favorite one below in the comments section. 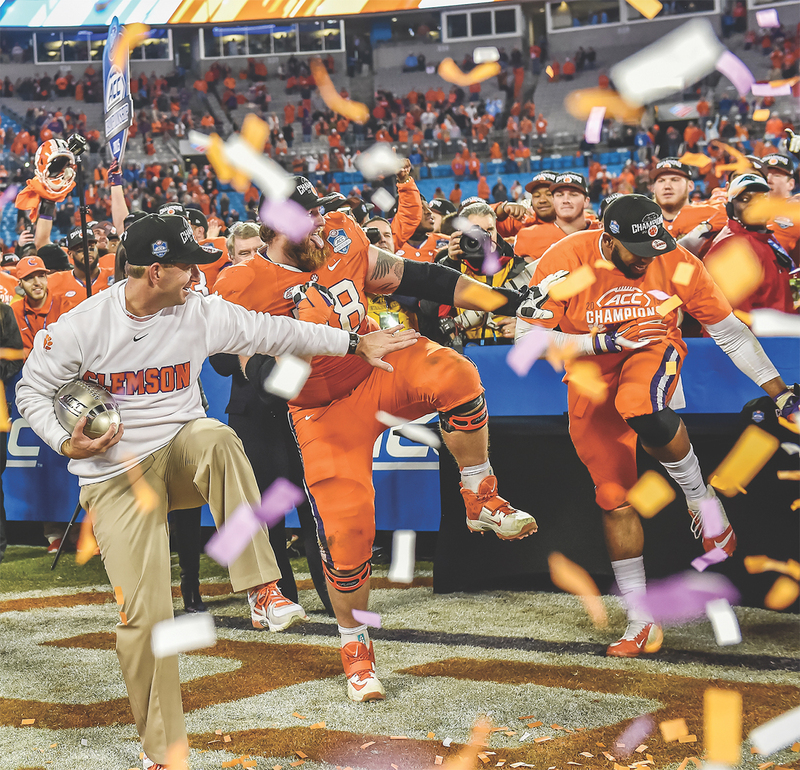 After eight years of emphasizing the same set of values, telling the same stories, repeating the same “Dabo-isms,” the culture that Swinney brought to Clemson is accepted and celebrated. There’s no handwringing about how Clemson needs to copy Alabama or any other college program. Instead, coaches from around the country are coming to campus, eager to find out what Dabo Swinney’s “secret sauce” really is. One thing they won’t find is the corporate approach to college sports that you find in many larger programs across the county, where decisions to retain a player or cut him loose often seem to be made with the bottom line in mind. How much is this going to cost us in wins? In revenue? One thing they’ll find out is that Swinney is committed to consistency and repetition and doing even the little things in a very great way. With a new class of young men coming in every year, there’s a need to make sure that every player understands the culture and the expectations and the Clemson family way. And so he starts over again every year with the same stories, the same lessons in life. They’ll find one of the most successful coaches in the country who still takes time to coach his youngest son’s baseball team, and encourages the other coaches to do likewise. One who realizes that despite the fact that it pays his salary, football is just a game. And that winning is important, but not nearly as important as impacting the lives of the young men in his program. In Dabo Swinney’s world, that’s the Clemson way. Photography credits: Ashley Jones, Mark Crammer, Mark McInnis, Bradley Moore, Dawson Powers, Carl Ackerman. All I can say is Dabo please never change! You’re an inspiration to not only your players and students on campus, but to us parents also. I am thankful every day that my son chose Clemson! a fan for life!!! This is the best and most refreshing article I’ve ever read on Clemson football — thank you!!! I attended Clemson myself 1976 – 1980, during some very successful football years under Charlie Pell and Danny Ford. I was exposed to Steve Fuller, Dwight Clark, and Jerry Butler, and the only one who showed even a smidgeon of class was Jerry Butler, who was as intelligent and interactive as a student as he was on the field. The sense of entitlement and “We are better because we are jocks” was pervasive. I graduated in 1980 and moved to Nebraska in October, right before the 1981 National Championship. Clemson won the game, but they didn’t win with class. Over the years, I read about the Huskers coach, Tom Osborne, and his coaching philosophy: building men of character who excelled at life as well as at football. I wished that for Clemson for many years, and am so thankful to see the same character in Coach Swinney. The young men who are playing football today show class, humility, generosity, and love for football and for one another. They are showing the country what makes Clemson special, and I am more proud of these coaches and players than I ever was with that National Championship in 1981. Praying for you through each game this year — let your light shine, guys; you ARE winners!!! Outstanding article, very well written with a message that so accurately depicts our head coach, our football program and our overall University mission which is to educate and prepare our students to be successful in their lives. That success isn’t just about how fat our checkbooks are nor how big our portfolios are. It’s not about the “toys”. Instead, it’s about what we believe and what we do with the opportunities, resources and blessings we have. I am very proud of what Dabo Swinney has done with and through our great Clemson University. Thank you Dabo! This explains exactly why I am glad you are coaching our young men. GBU. Great article! 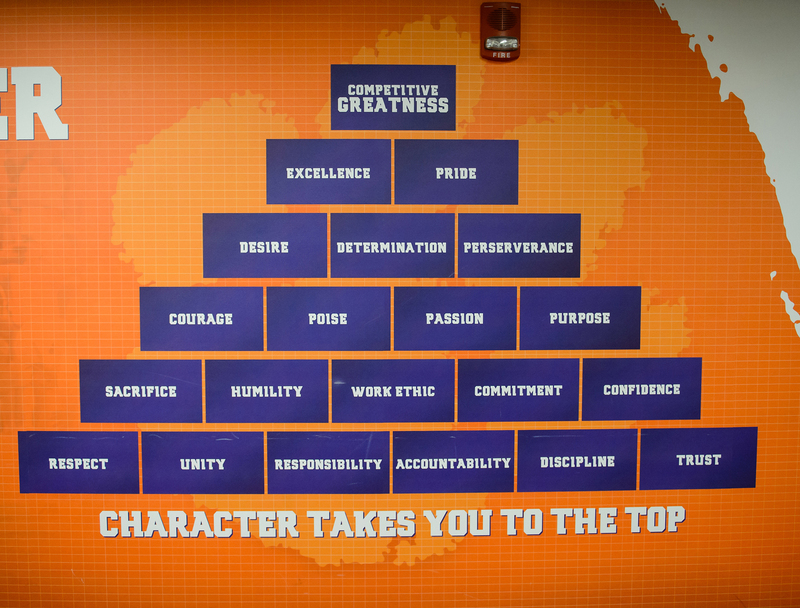 Coach Swinney is a man of faith and principle….and a pretty darn good coach as well. Football is a game, life is real and he continually keeps that perspective. GO TIGERS!!! This is one of the best articles I have ever read!!! I’ve never met Coach Swinney but would love to someday!!!! His faith, values, and love shines through him in everything he does!!! Never change Coach because GOD’S got your back!!!!!! !